Sunday evening, BandMan's parents came over for family dinner, good food, lots of laughs, some weird squirrel card game that belongs to VegKid, and a bottle of wine. 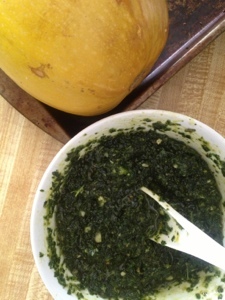 2 spaghetti squash, slow roasted and sauteed with garlic, basil and parsley. Salad - yam croutons, pecans, grape tomatoes, and an orange white balsamic dressing. If your mouth isn't watering it might be time to check your pulse. The kale pesto was out-of-this-world delicious. I stuffed my face Sunday night until I couldn't hold another bite, but I still found myself plotting and scheming on how to get the leftover kale in my breakfast come morning. And then again for lunch that day. Yeah that good. 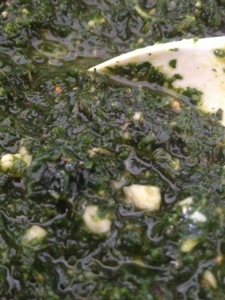 Click HERE to find some other things you can do with pesto. Add all the ingredients to a food processor except the olive oil. Pull the trigger until they are combined and crumbly. Add the olive oil and stay on that trigger until everything is all wet...That's what she said. oh my goodness gracious pants. i need to make this asap. i love kale. and pesto. you are my hero.